Newborns are best photographed in the “buff” – possibly incorporating fun hats, wraps and headbands. 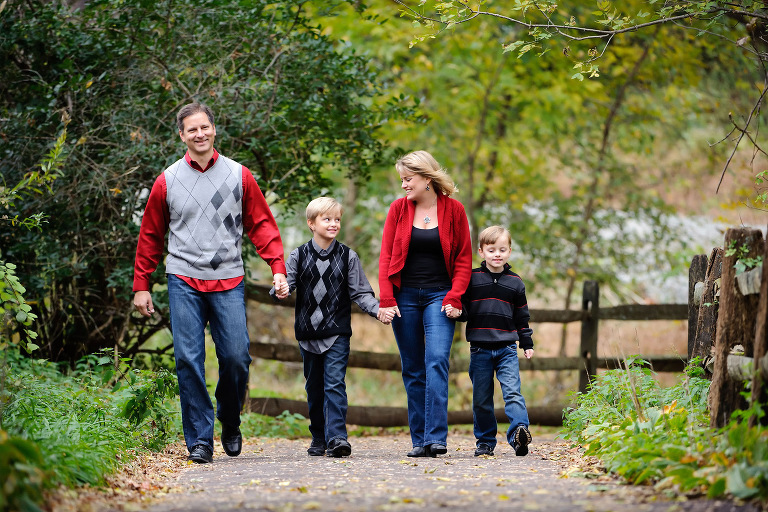 Parents, participating in photos, should lean toward solid colors, avoiding patterns that could be distracting. For mom, a simple, black or white shirt (tank, short-sleeved, or tube top) works great! For dad, a white or black t-shirt is fine. And, if dad is so inclined, removing his shirt and snuggling his little one against his chest can create some amazing images of father and child. 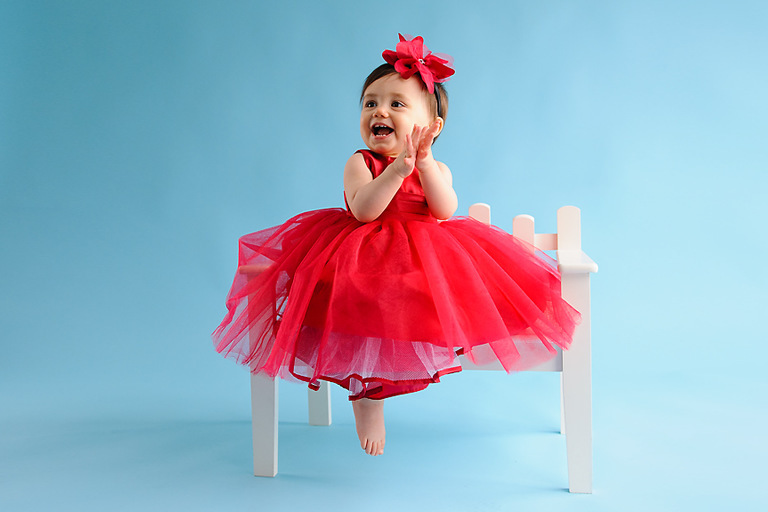 Pick a few of your favorite outfits that you feel show the personality of your little one. Bright colors photograph well, and hats, headbands and other accessories can add a whimsical touch. Bare-foot babies are pleasing, so no need for fancy shoes, unless of course you have some you would like to bring. The cake part of the Cake Smash session is so much fun and most children have a delightful time “interacting” with their cake. 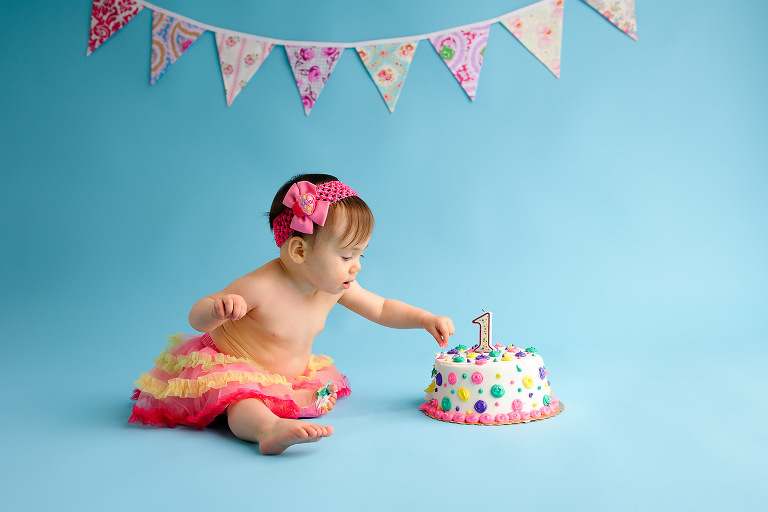 For this, slightly messy part of the session, girls look adorable in just a little tutu (we have an assortment in studio) and possibly a headband, and little boys are so cute in just their little jeans/pants/shorts. Plus, less clothing means less to get covered in cake. What to Wear? This is a question that seems to provide a lot of unnecessary stress. First and foremost, you should be comfortable in what you are wearing. If you (or the kids) aren’t comfy in what you have on, it shows in the pictures. I recommend clients choose outfits allowing them to sit comfortably and pose casually (maybe a family shot seated in a field, or snuggling a child on your lap) and shoes that allow a bit of walking giving us the chance to explore our chosen location and select a few different venues. This is not the time to race out and spend a lot of money on fancy matching outfits and uncomfortable shoes. It is very likely that you have just what you need hanging in your closet already or with the addition of a few items you can build on what you have. Many very reasonable retailers (like the Gap and Old Navy) offer classic selections in a wide variety of great colors. After comfort, the thing to think about is color. Colors in portraits help set the tone, create a feeling of cohesiveness among subjects and of course express personality. Some clients go for a look where everyone is wearing the same color (maybe jeans with a solid colored shirt). This can work well, creating a more formal, tied together look. Other clients create a more casual look by selecting a color palette that includes 2-3 coordinating colors and then choosing clothing items within those shades, using mostly solids with maybe an accent pattern thrown in. Take a look at some of these sample wardrobe color palettes and coordinated outfits on Pinterest to get some ideas and feel free to call me if you need help creating the perfect wardrobe for your session.